When creating a custom Alexa skill, you will need to provide an invocation name that users will use to invoke and interact with your skill. The invocation name does not need to be the same as your skill’s name but it must meet certain criteria to ensure a positive user experience. The invocation name you provide should also easily identify your skill’s capabilities, be memorable and also be accurately recognized by Alexa herself. 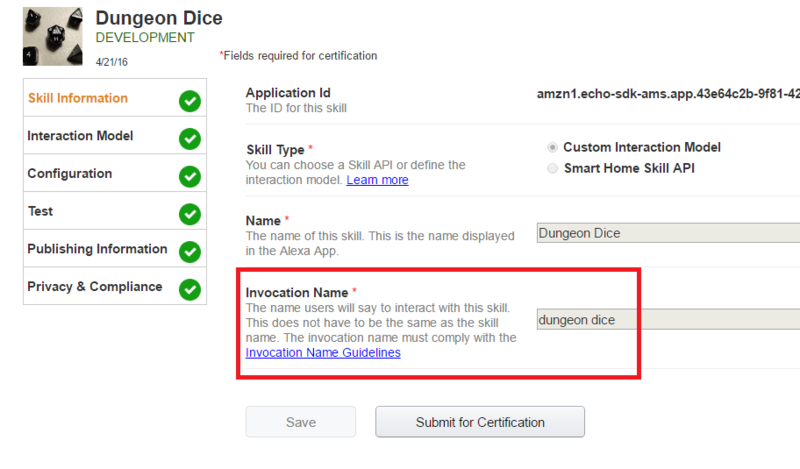 Your service gets called when customers use your invocation name, such as “Alexa, ask dungeon dice for a d20.” In this example, users invoke the custom Alexa skill by using the Invocation Name ‘dungeon dice’ along with a supported phrase for requesting the service. Here are some additional examples of the supported phrases for requesting an Alexa skill. For a complete list of all launch phrases, see Understanding How Users Invoke Custom Skills. In order to simplify the process for choosing acceptable invocation names, we are providing new guidance. You’ll need to meet the following requirements in order to pass certification starting 5/25. The skill invocation name must not infringe upon the intellectual property rights of an entity or person. One-word invocation names are not allowed, unless the invocation name is unique to your brand/intellectual property. Invocation names which are names of people or places (for example, “molly,” “seattle”) are not allowed, unless they contain other words in addition to the name (for example, “molly’s horoscope”). The invocation name must not contain any of the Alexa skill launch phrases and connecting words. Launch phrase examples include “launch,” “ask,” “tell,” “load,” and “begin.” Connecting word examples include “to,” “from,” “by,” “if,” “and,” “whether.” See Understanding How Users Invoke Custom Skills for a complete list of skill launch phrases and connecting words. The invocation name must contain only lower-case alphabetic characters, spaces between words, possessive apostrophes (for example, “sam’s science trivia”), or periods used in abbreviations (for example, “a. b. c.”). Other characters like numbers must be spelled out. For example, “twenty one.” The name must be easy to pronounce correctly and be phonetically distinct to avoid being misinterpreted as other similar sounding words. The invocation name must not create confusion with existing Alexa features. If your invocation name overlaps with common Alexa commands, users may get confused by Alexa's response and not enable your skill. For example, if your invocation name is too similar to the built-in "weather" command, Alexa may sometimes respond with your skill and sometimes respond with the built-in weather feature, providing an inconsistent user experience. The invocation name should also fit smoothly with at least one of the Alexa skill launch phrases (for example, “launch,” “ask,” “tell,” “load,” “begin”) to allow customers to naturally invoke the skill. Finally, plan on spending some time testing your invocation name once you have an initial version of your service up and running. When testing with an Alexa-enabled device, you can see how Alexa interpreted your invocation name by reviewing the history in the Amazon Alexa App (in the app, navigate to Settings and then History).